How fitting that The Savannah Children’s Theatre makes fairy tales come true, as we embark upon our Creative Dramatics II class production of Once Upon A Mattress, Jr! Princess Winnefred’s main desire is to find her “Happily Ever After” and claim a prince who will love and accept her with all her perfect imperfections! Along with a haughty Queen and a mute King, this musical was based on Hans Christian Andersen’s tale The Princess and the Pea. Co-Directors, Mr. Christopher Blair and I, agreed to begin this session a little differently because of one notoriously comedic, red headed woman. She made her Broadway debut as Princess Winnefred in 1959 and, thankfully, archives of her performance can be found online. She also reappeared as Queen Aggravain in the 2005 TV Movie. Who is this woman? 1974 Broadway production of “Once Upon a Mattress.” Music by Mary Rogers, lyrics by Marshall Barer, Book by Jay Thompson, Dean Fuller & Marshall Barer. Why, the one and only, Carol Burnett, of course! Her universal comedic timing still speaks to us, and spoke to the students as well. By watching specific archived scenes and dance numbers, the students were able to understand the style of the production, along with the exaggerated emotion and physical mannerisms within each character. The writing is witty with sharp remarks and quick comebacks. Physically, the show is very demanding, replete with dance numbers and physical comedy. The Spanish Panic, which was the choice for our dance audition, is full of vigor and fun. 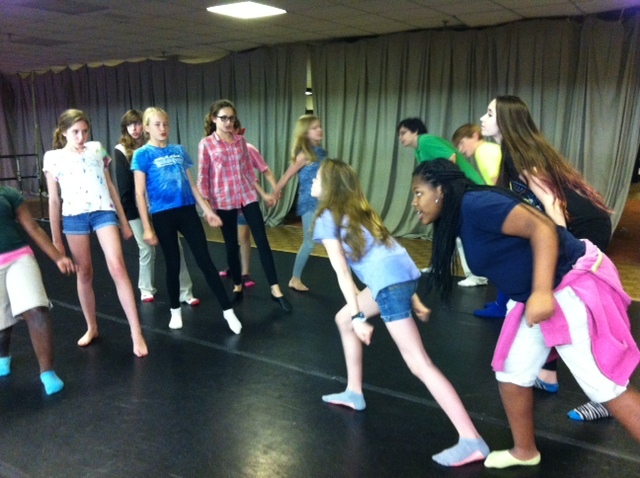 With a very upbeat tempo, the students have found joy in partner work, and the importance of breath support! Our own Larken & Sir Harry! While we have thoroughly enjoyed researching and exploring our characters, we have also found great benefit in utilizing SCT’s dance floor to observe our posture and dance formations. The ability to view the full body while dancing is crucial in creating a look that lends towards the time period of this production. The ladies are encouraged to extend their necks while walking in a smooth and proper manner, and the gentleman are encouraged to be “on-guard” with a strong stance showing their calf muscles and upper body strength. 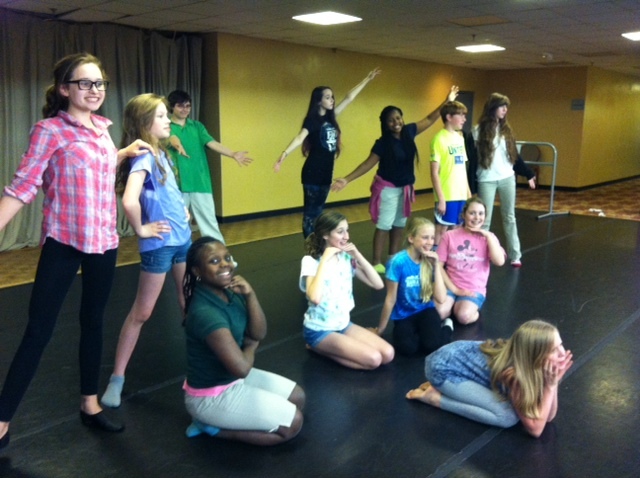 This is a lot of fun for our girls-cast-as-boys to explore a more masculine demeanor within themselves. Our boys are always outnumbered by our girls, but everyone seems to embrace this fact with enthusiasm and acceptance. Don’t be fooled! The young ladies you see on the right (stage left) are acting as Knights! As is with all productions with SCT, it is imagination and creativity that brings these shows to life. SCT productions build their success by all the volunteers, staff and encouraging parents who have given their children the opportunity to explore the art of theatre. Thank you for all that you do in supporting our theatre. This is a class show surely not to miss! “Once Upon a Mattress, Jr.” opens Friday, May 9th at 7:00pm ,with Saturday and Sunday matinees at 3:00pm. Click here for tickets!